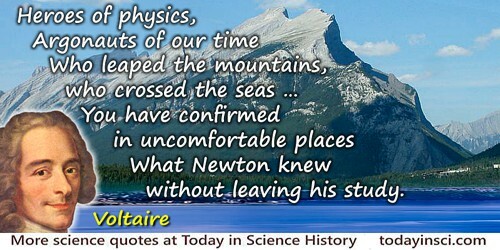 French author who popularized Isaac Newton's work in France by arranging a translation of Principia Mathematica. He added a commentary to explain it to non-scientists. A Frenchman who arrives in London, will find Philosophy, like every Thing else, very much chang’d there. He had left the World a plenum, and he now finds it a vacuum. At Paris the Universe is seen, compos’d of Vortices of subtile Matter; but nothing like it is seen in London. In France, ‘tis the Pressure of the Moon that causes the Tides; but in England ‘tis the Sea that gravitates towards the Moon; so what when you think that the Moon should make it flood with us, those Gentlemen fancy it should be Ebb, which, very unluckily, cannot be prov’d. For to be able to do this, ‘tis necessary the Moon and the Tides should have been enquir’d into, at the very instant of the Creation. Letter XIV. 'On DesCartes and Sir Isaac Newton', in Letters Concerning the English Nation (1733), 109-110. 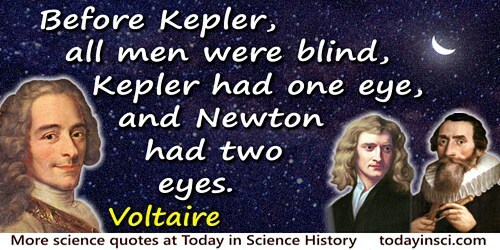 Before Kepler, all men were blind, Kepler had one eye, and Newton had two eyes. Bile makes man passionate and sick; but without bile man could not live. Translation of the original French, “La bile rend colère et malade; mais sans la bile l’homme ne saurait vivre.” From Zadig. Accompanied with the translation in Craufurd Tait Ramage, Beautiful Thoughts from French and Italian Authors (1866), 371. A Philosophical Dictionary: from the French? (2nd Ed.,1824), Vol. 5, 239-240. Descartes constructed as noble a road of science, from the point at which he found geometry to that to which he carried it, as Newton himself did after him. ... He carried this spirit of geometry and invention into optics, which under him became a completely new art. A Philosophical Dictionary: from the French? (2nd Ed.,1824), Vol. 5, 110. He who has heard the same thing told by twelve thousand ocular [eye]witnesses, has only twelve thousand probabilities, equal to one strong one, which is not equal to certainty. I know of nothing more laughable than a doctor who does not die of old age. Letter to Charles Augustin Ferriol, comte d'Argental (1767). In Raymond C. Rowe, Joseph Chamberlain, A Spoonful of Sugar (2007), 243. In fact, no opinion should be with fervour. No one holds with fervour that seven times eight is fifty-six, because it can be shown to be the case. Fervour is only necessary in commending an opinion which is doubtful or demonstrably false. 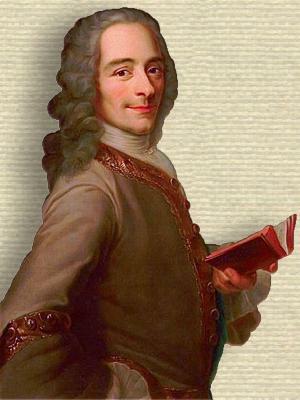 In Institut et Musée Voltaire, Studies on Voltaire and the Eighteenth Century (1994), 314. Also quoted in Max Perutz, Is Science Necessary? (1991), 196. In medicine … beware of ambiguity. In A Philosophical Dictionary (1824), Vol. 1, 39. 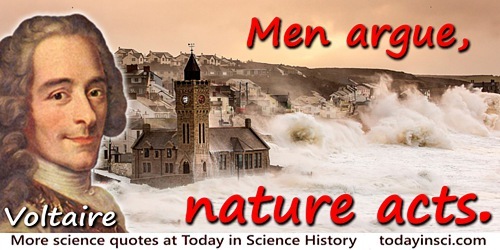 It is not strictly demonstrated that atoms are indivisible; but it appears that they are not divided by the laws of nature. In A Philosophical Dictionary (1824), Vol. 1, 339. It is said, sometimes, that common sense is very rare. From the original French, “On dit quelquefois, Le sens commun est fort rare.” in Dictionnaire Philosophique Portatif (1765), New Edition, Vol. 2, 276. As, translated in A Philosophical Dictionary: From the French of M. de Voltaire (1824), Vol. 2, 242. Translation of the original French, “C'est l'éclair qui paraît, la foudre va partir.” From the play, Oreste, Act 2, Scene 7. Accompanied with the translation in Craufurd Tait Ramage, Beautiful Thoughts from French and Italian Authors (1866), 365. Mathematics must subdue the flights of our reason; they are the staff of the blind; no one can take a step without them; and to them and experience is due all that is certain in physics. In Oeuvres Completes (1880), t. 35, 219. Voltaire and H.I. Woolf (trans. ), Voltaire's Philosophical Dictionary? (1924), 281. A Philosophical Dictionary? (1764, 1843), Vol. 2, 317. Society is as ancient as the world. From the original French, “La société est donc aussi ancienne que le monde”, in 'Politique', Collection complette des œuvres de Mr. de Voltaire (1774), Vol. 24, 255. As translated in 'Policy', A Philosophical Dictionary (1824), Vol. 5, 259. 'A Treatise in Toleration'. In Voltaire, Tobias George Smollett (ed.) and William F. Fleming (trans. ), The Works of Voltaire (1904), Vol. 4, 265. The art of causing intemperance and health to exist in the same body is as chimerical as the philosopher’s stone, judicial astrology, and the theology of the magi. From the original French, “L'art de faire subsister ensemble l'intempérance et la santé, est un art aussi chimérique que la pierre philosophale, l'astrologie judiciaire, et la théologie des magies”, in Zadig. Accompanied with the translation in Craufurd Tait Ramage, Beautiful Thoughts from French and Italian Authors (1866), 371. Attributed. Webmaster has found no other citation. See, for example, Bill Swainson, Encarta Book of Quotations (2000), 961. The word atom signifies without parts—not to be divided. You divide it in thought; for, if you were to divide it in reality, it would no longer be an atom. In A Philosophical Dictionary (1824), Vol. 1, 338. There is an astonishing imagination, even in the science of mathematics. … We repeat, there was far more imagination in the head of Archimedes than in that of Homer. In A Philosophical Dictionary: from the French (1824), 126. There is no sect in geometry; we never say,—An Euclidian, an Archimedian. In 'Sects' Philosophical Dictionary (2010), 269. When he to whom a person speaks does not understand, and he who speaks does not understand himself, that is metaphysics. 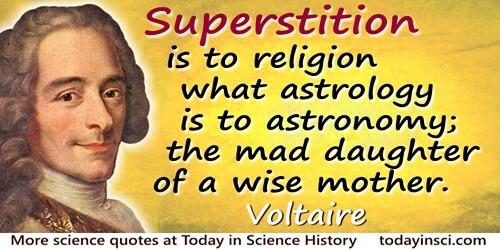 21 Nov - short biography, births, deaths and events on date of Voltaire's birth. 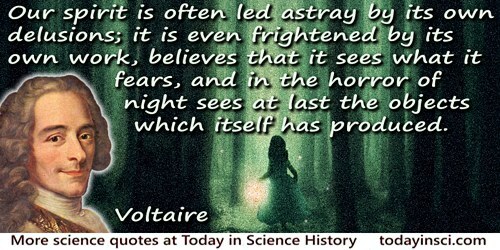 The attitude of Voltaire to magic and the sciences, by Margaret Libby. - book suggestion.